Tower cranes are electric driven hoist devices powered by electricity . They are used for civil and industrial construction sites. 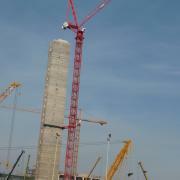 Tower cranes are erected on top of concrete foundation for fixed into it.